Created, developed and produced in Italy. The application of EyeLife is ideal during relaxation or ocular swelling and stress. After having Cooled the gel pad in the fridge for about 60 minutes, apply on the face to obtain all the refreshing and relaxing relief to the eye. Applications can be carried out several times a day. 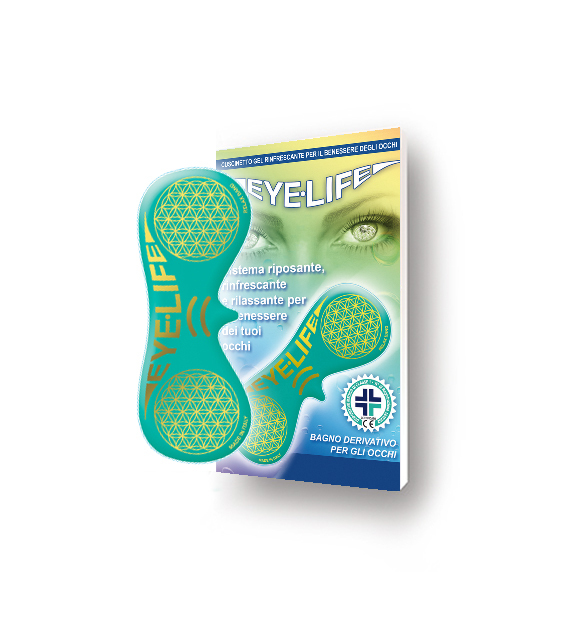 EyeLife is a refreshing gel pad suitable for eyes well-being which at the same times provides a refreshing, soothing and revitalizing feeling. EyeLife is an effective system which applies the principle of the detox baths to give the eye zone and the face in general all the beneficial effects of this practice. Its application is recommended during sleep providing a relaxing and revitalizing effect or else as an aid for eye well-being during congestion or serious ocular stress. Rinfreshing, tonification and reduction of swelling of ocular zones. Ideale per le donne è l’applicazione di EyeLife a viso struccato, refrigerato in frigorifero o in congelatore, a seconda della tollerabilità personale, perchè favorisce il trucco, rinforza le palpebre, la zona oculare. Applicando il principio dei bagni derivativi la pelle del viso risulta tonica, rinvigorita e previene la formazione di rughe. What is normally defined as headache could be the cause of multiple factors related to stress or poor health. One of these factors is caused by the nasal sinuses obstruction which are often the cause of headaches and migraine, also together with sinusitis and hay fever. EyeLife sooths the symptoms. EyeLife is ideal for the prevention or the remedy for ailments regarding the eye but also the eyelids, eyelids edges, such us: conjunctivitis, stys, blepharitis, chalazion. After having cooled the pad for at least 60 minutes in the fridge or the freezer according to personal tolerance. EyeLife provides numerous benefits: clearing, soothing, drainage of the eye and the eye zone. It helps relaxing the bags under the eyes as well as reducing their swelling. It proves a soothing effect after excessive stress and eye tension due to exposure to computer display, wind, too much sun, and contact lenses. After having Cooled the gel pad in the freezer or fridge according to personal tolerance, for approximately 60 minutes, apply on the face. Applications can be carried out several times a day during resting or relaxing. Non toxic gel: distilled water, cellulose, food coloring and additives. In case of accidentally contact with skin, rinse with water without rubbing. External coating: anatomical pad completely ascetic and hypoallergenic, with a high mechanical resistance to continual rubbing, high frequency welded and stuffed with about 90 grams of viscous gel. The product is vacuum packed in order to ensure maximum hygiene. Suitable for men and women, EyeLife pad has to be applied according to the indications described above and should not be applied for a different purpose from the one that has been indicated. 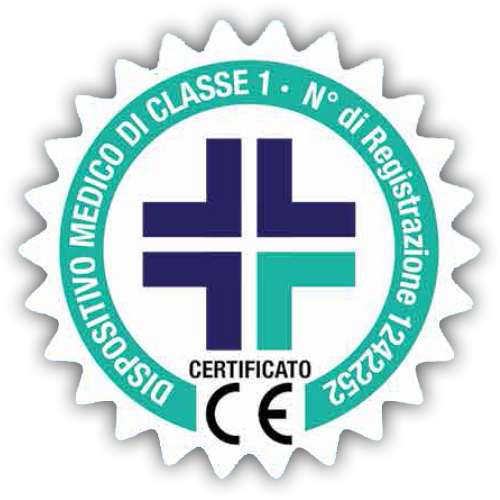 The product is certified by Italian Health Ministry as a medical device, type 1 – registration number 1269624.